Let’s start with some basics. There are at least ten varieties of ginseng, each with its own characteristics and benefits. So where does ginseng grow in America? You can find most ginseng on ginseng farms, although it also grows wild in Appalachia and the Ozark areas. American ginseng, also known as panax quinquefolius, can only be harvested if the plants are at least five years old. Agricultural groups heavily regulate wild ginseng growth, which means if you pick ginseng in the wild, you may have to fork up a hefty fine. These strict restrictions stem from its high demand and its dwindling supply: agricultural groups classify American ginseng as “vulnerable” in some states, meaning it’s at high risk for becoming endangered. Ginseng plants grow to 18 inches in height and feature groups of five leaves. Only mature plants grow red berries. American ginseng prefers moist soil and lots of shade. While many supplements, teas, and tinctures use its leaves for medicinal benefits, the nutrient-rich ginseng root is the most popular form of the supplement. The root resembles ginger root and fetches incredibly high prices in Asia. Roots with longer offshoots are considered more desirable. Native American medicine uses ginseng as an essential healing ingredient. In the 18th century American colonies, ginseng was a prized commodity. Thomas Jefferson wrote about American ginseng in his botany studies, and America paid off debts to France by selling this herb to international traders. Asian ginseng and American ginseng are popular in China but for different purposes; nevertheless, both are essential herbs in Traditional Chinese Medicine. In fact, America exports 80 percent of its ginseng to China (x). Can ginseng really add some zip to your day? Can it give you an extra boost in the bedroom? Or help you remember every task on your to-do list? Read on to find out. Ginseng contains compounds called ginsenosides, which may be the key to its superpowers. 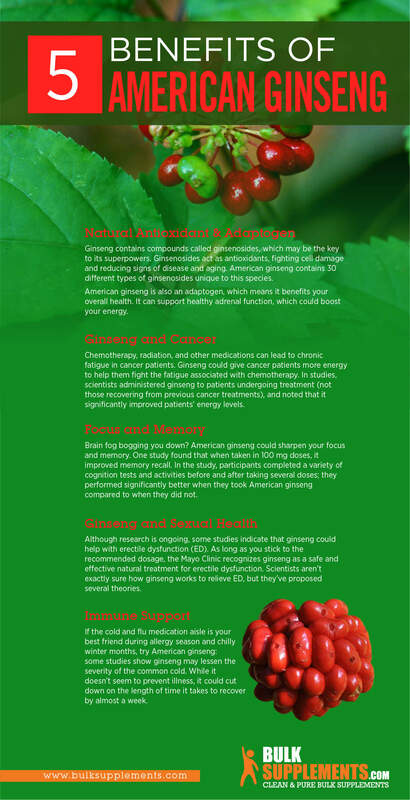 Ginsenosides act as antioxidants, fighting cell damage and reducing signs of disease and aging. American ginseng contains 30 different types of ginsenosides unique to this species (x). 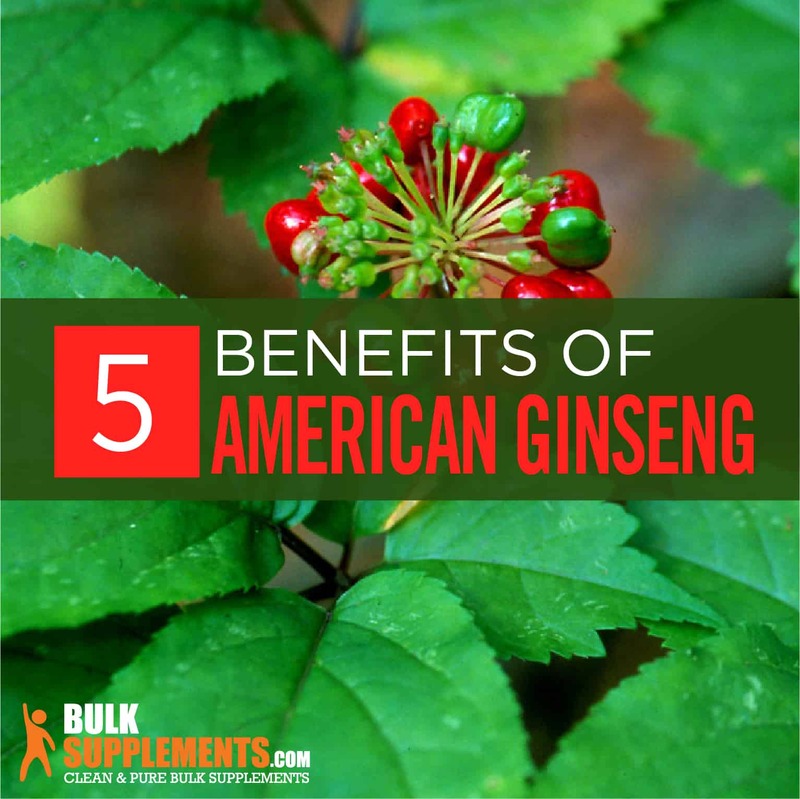 American ginseng is also an adaptogen, which means it benefits your overall health. It can support healthy adrenal function, which could boost your energy. Chemotherapy, radiation, and other medications can lead to chronic fatigue in cancer patients. Ginseng could give cancer patients more energy to help them fight the fatigue associated with chemotherapy (x). In studies, scientists administered ginseng to patients undergoing treatment (not those recovering from previous cancer treatments), and noted that it significantly improved patients’ energy levels (x). Brain fog bogging you down? American ginseng could sharpen your focus and memory. One study found that when taken in 100 mg doses, it improved memory recall. In the study, participants completed a variety of cognition tests and activities before and after taking several doses; they performed significantly better when they took American ginseng compared to when they did not (x). Ginseng may act similarly to testosterone to stimulate an erection. Ginseng promotes nitric oxide production, which stimulates healthy blood flow and relaxation to relieve ED. 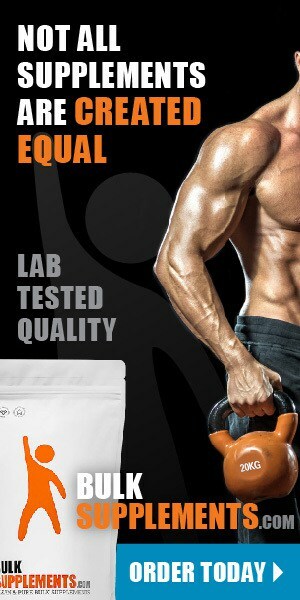 Ginsenosides may work to stimulate an erection by relaxing muscles and promoting circulation. If the cold and flu medication aisle is your best friend during allergy season and chilly winter months, try American ginseng: some studies show ginseng may lessen the severity of the common cold (x). While it doesn’t seem to prevent illness, it could cut down on the length of time it takes to recover by almost a week (x). Ginseng is a prized herb in China and a popular Chinese gift. According to Traditional Chinese Medicine categorization, American ginseng has “cool” energy while Chinese ginseng has “warm” energy. Wisconsin grows 95 percent of the American ginseng exported internationally. You can typically find American ginseng available in capsules, teas, and as a powder. Always Check the label before you buy American ginseng, as some brands may only contain a tiny percentage of the herb. American ginseng extract powder generally contains a purer concentration of the herb’s beneficial compounds. As a dietary supplement, take 1000 mg (rounded 1/2 tsp) one to two times daily, or as directed by your physician. Some reported side effects include changes in heart rate, breast tenderness and vaginal bleeding in women, digestive issues, and nervousness. Avoid drinking coffee when you take ginseng, as it could increase the risk of insomnia. Do not take American ginseng if you are pregnant or nursing, if you have diabetes, or if you have schizophrenia. American ginseng can interfere with certain medications, including antidepressants, aspirin and blood pressure pills.